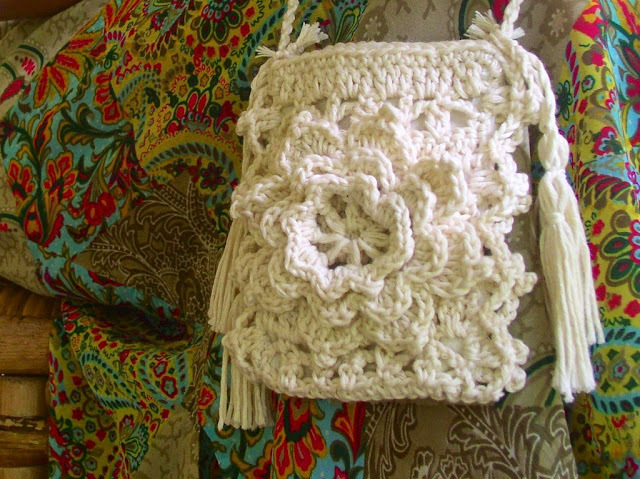 A delicate purse with the Irish crochet flower motif in the center. Design Notes: The purse is a rectangle worked flat in rows, with a lacy edging crocheted down along one side, plain edging across the short end, lacy edging up across the other side, then plain edging again across the other short end. Sew the flower and then a suitable lining. Then the rectangle is folded in half so the two short ends meet, and the side seams are sewn together, catching the ends of the strap (a Monks Cord) at the top along the sides. CL2 (2-dc Bobble): [Yo, insert hook in st and draw up a loop, yo and draw through 2 lps on hook] twice, yo and draw through all 3 lps on hook. With cotton yarn, ch 5, sl st in first ch to form ring. Rnd 1: Ch 5, [dc in ring, ch 2] 7 times, sl st in 3rd ch of ch-5 to join. Rnd 2: *[Sc, hdc, dc, hdc, sc] in ch-2 sp, rep from * in all ch-2 sps. You should now have 8 petals. Rnd 3: Working behind the petals, sc around post of dc in row 1 just below the current st, ch 4, sc around next dc, rep from * all around to the last dc. Rnd 4: *[Sc, hdc, 3 dc, hdc, sc] in ch-4 loop, rep from * in all ch-4 loops, ending sc in first sc. Rnd 5: Working behind the petals, *ch 6, sc around 2 sc in row 3, rep from * all around. Rnd 6: *[Sc, hdc, 3 dc, ch 3, sl st in top of last dc just made, 3 dc, hdc, sc] in each ch-6 loop. Sl st in the first sc to join, Fasten off. (The purse is a rectangle with a lacy edging crocheted down along one side, plain sc edging across the short end, lacy edging up across the other side, then plain sc edging again across the other short end of the pouch. Then the rectangle is folded in half so the two short ends meet, and the side seams are sewn together). 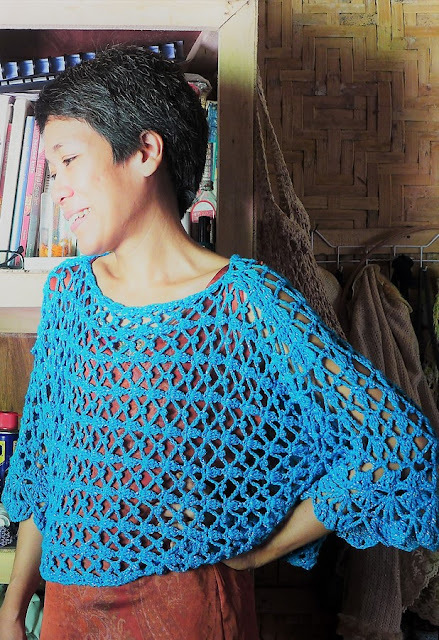 With cotton yarn, ch 18. Row 1: Ch 4 (count as 1 dc), dc in 5th ch from hook, dc in each ch across (19 dc). Ch 1, turn. Row 2: Sc in first dc, *ch 3, sk 2 dc, CL2 in next dc, ch 3, sk 2 dc, sc in next dc, rep from * across, ending with sc in top of first ch-3; ch 5 (count as 1 dc and 2 ch), turn. Row 3: *Sc in top of CL2, ch 2, dc in next sc, ch 2, rep from * across, ending with dc in last sc; ch 3, turn. Row 4: *2 dc in ch-2 sp, dc in sc, 2 dc in next ch-2 sp, dc in dc, rep from * across, ending with dc in 3rd ch of ch-5; ch 1, turn. Sc around post of dc,* ch 3, dc in next sp, ch 3, sl st in top of dc just made, dc in same sp, ch 3, sc in next dc post, rep fr * all across the length of the purse, down to the last row of dc’s. Now working along the short side of the purse, make sc in first ch of foundation ch and in each ch across. Ch 1, now working along the length of the other side of the purse, sc around post of last dc, * ch 3, dc in next sp, ch 3, sl st in top of dc just made, dc in same sp, ch 3, sc in next dc post, rep fr * all across the length of the purse, down to the last row of dc’s. Now working along the short side of the purse, make sc in top of dc and in each dc across. Fasten off. 1. Cut 3 or more strands of yarn at least 3 times the desired finished length of the strap. Make a knot at each end of the yarn. Slip one end of the yarn to a hook to secure it and put a pencil or crochet hook on the other end as a twisting handle. 2. Use the “handle” to twist the yarn tightly. Keep a steady tensions and be careful not to let go. Keep twisting until the yarn is full of twists and wants to kink up on itself. 3. With your thumb and forefinger, pinch the yarn at halfway point and bring the knotted ends of the yarn together. Let the yarn twist on itself to make a cord. 4. Now, untie the knots and re-tie them together into one knot. You should now have a nicely twisted Monk’s Cord! 1. Cut or fold up a sturdy piece of cardboard that’s about half to one inch longer than the desired length of the tassel you want to make. My tassel is 3.5 inches long so I used a cardboard 4.5 inches long. 2. Wrap the yarn lengthwise around the cardboard as may times as you need to get a good thick tassel. I wrapped the yarn for my tassel about 12 times. 3. Get another yarn cut to 6 inches and slip this under the wound yarn and pull up towards the top. 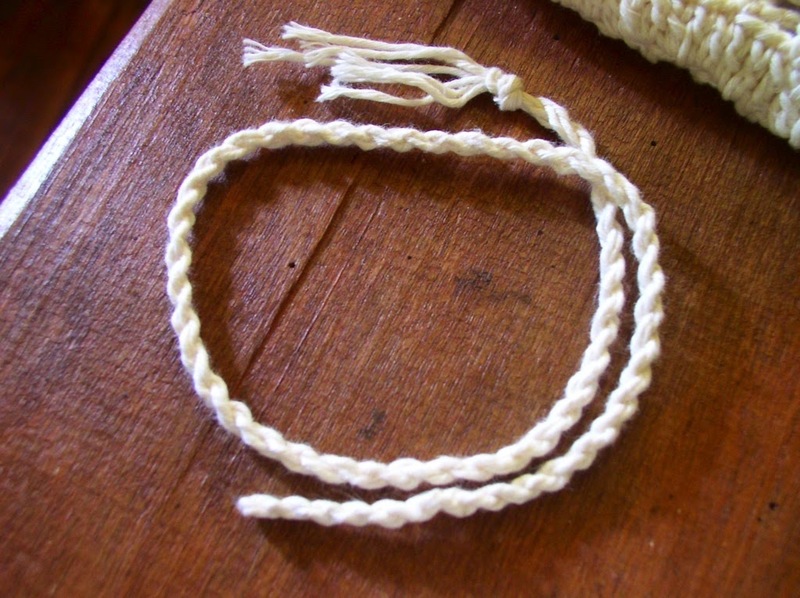 Now tie this yarn (called a “hanging loop”) securely around the top of the tassel. Slide the tassel off the cardboard then cut the yarn at the base. 4. Cut another piece of yarn about 3 times the length of the tassel and wrap this tightly around all the strands about half to an inch away from the hanging loop of the tassel. 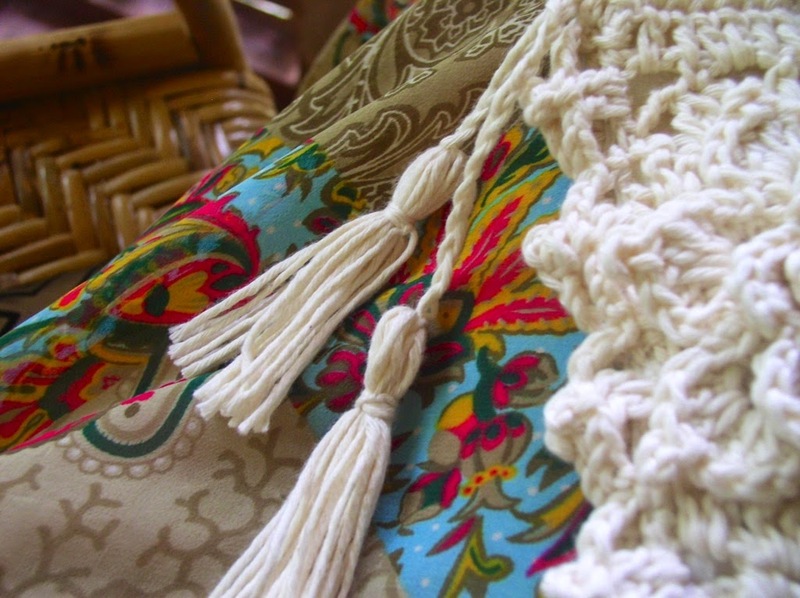 Secure the ends of the wrapping yarn by threading them under the strands and down through the center of the tassel. Trim the ends with sharp scissors. Sew two tassels to each end of the Monk’s Cord. Block the rectangle. Sew the flower to the purse in place as shown in the model photograph. 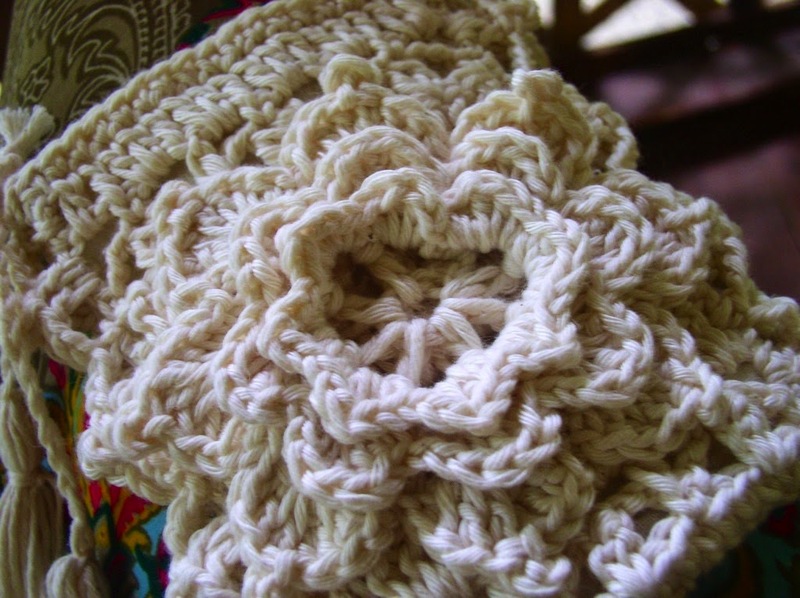 Use back- stitch, around the center of the flower and all along the outermost petals, to make a strong and secure hold, but don’t flatten the petals! Sew on a suitable lining. Then sew up the side seams, catching the ends of the Monk’s Cord at the top sides, with the tassels sticking out at the sides.